Over the past several years, I’ve been very blessed to be a part of some very good critique groups. Even though writing itself is a solitary endeavor, I believe that associating with other writers – whether it’s with critique partners, a creative writing class, or a big writers conference – is vital to any writer’s growth. So what are the benefits of joining a writing critique group? 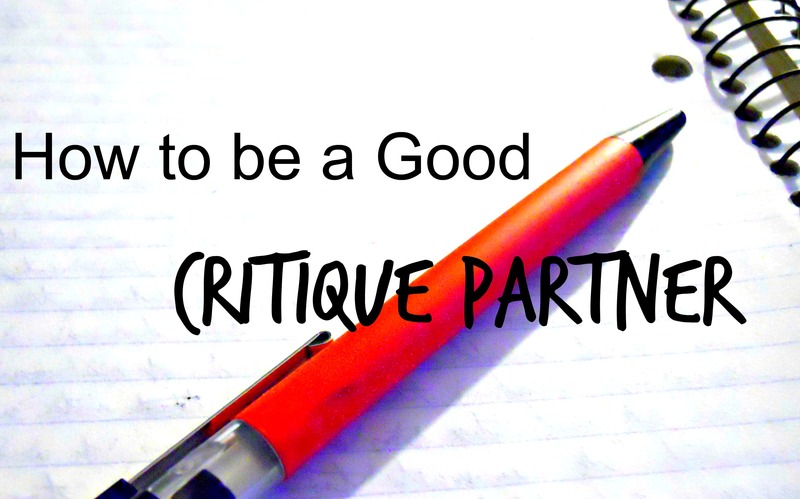 How do you know if your critique partners will be helpful or useful? How can you make sure that you yourself will be a good critique partner? Critiquing a fellow writer’s work involves much more than just saying “I liked it.” It’s also much more than line editing, where you call out every unnecessary comma and misspelled word. Every critique group has their own set of rules and expectations, but usually groups are made up of writers submitting a first or maybe second draft, and looking for overall feedback. Does the story flow? Is there too much head-hopping or other issues with point of view? Are there confusing plot points? Do the characters feel real, or just one-dimensional? These are some good aspects to consider when you’re critiquing other’s work. A critique group should be a safe place for every member. Even if you’re not BFFs, or you’re not a fan of the genre that some other groups members write, everyone in the group needs to get along at least at a professional level. You all have one thing in common: you’re writers, and you want to get better at your craft. Find encouraging things to say, even if a piece you’re critiquing is a mess of POV changes and plot holes. The world is hard enough on writers – let’s not be hard on one another. A critique group should be a balance of give and take. Each group has their own methods, and an online group of ten people will have a different way of functioning from three friends who meet together at the coffee shop every week. But in general, you should be expected to contribute. That is, you should contribute work to be critiqued by others, and you should contribute critiques of others’ work. Nobody likes that critique partner who shows up only when they’ve submitted a piece, or who gives bland critiques of “it was good” while expecting detailed critiques of their own work. Have you ever been in a really good critique group? A really bad group? Please share your experiences and insights! Great advice! For years, I’ve bounced around trying to find a critique group that I fit into, and the one I regularly attend now has been fantastic. They hit all your points you just mentioned. We’ve all seen people come two times to get their short story critiqued and then they never show up again. 😛 So annoying. I also appreciate the fact that we can all take a critique without feeling personally attacked, but we also make an effort to always point out the positive int he work, too. It’s a tricky balance, but awesome partners can find it. I’m glad you finally found a critique group that’s a good fit! Yes, the point about being able to take a critique about your work without getting personally offended is very important! Feeling personally attacked – or turning a critique into a personal attack against another writer – is a good way to kill a critique group. So glad that you have awesome critique partners! I will always suggest to take part to a critiquing groups if at all possible and to get in touch with other writers and exchange work. It made a world of difference for me. I was a member of an online workshop for seven years (I left about a year ago, because I realised I had outgrown the group) and it was a wonderful excperience. I learned a lot from having my work critiqued as well as critinquing other peopel’s work. Writers who have never partecipate in a workshop dont’ realise this, I think: it’s a two-way learning. I know writers who don’t want to partecipate becuase ‘I don’t have time to critique other people’s work, I’m too busy with mine’. Well, you know what? Helping other people is always worth it, because in helping them, you’re helping yourself. Now I have my personal circle of friends and this is even better than the workshope, because these are all people I trust, whose work I know and respect, people I know won’t hold back if they have to make a criticism and I know I’d better listen when they do. Sure, we could make writing a solitary activity, but it’s only when you consort with other writers that we really graw. I totally agree. I’ve learned more about writing by critiquing other people’s work than by having my own critiqued! It’s so valuable.